Uvi Poznansky wears a coat of many colors. Originally from Israel where she studied Architecture and Town Planning then moving to the US where she studied Computer Science and became an expert in Software Engineering, Poznansky managed to combine the design elements of two studies into unique formats. And she has accomplished the same with the other side of her brain - making visual her ideas (she is an accomplished painter, drawer, and sculptor who has enjoyed exhibitions both in Israel and in California, her present base) and making words in poetry and in short stories and children's books. APART FROM LOVE: Still Life with Memories Bundle Book 2 includes THE MUSIC OF US, DANCING WITH AIR and MARRIAGE BEFORE DEATH. Having read them together allows sharing the scope of what came before this book – and sharing that is important. Uvi’s skill at both visual and written art is outstanding, but her history of diversity does not end there. A brief synopsis leads into the conclusion of her 20th century story, MARRIAGE BEFORE DEATH: ‘After D-Day, her photograph appears on the most-wanted Nazi propaganda posters. Who is the girl with the red beret? She reminds him of Natasha, but no, that cannot be. Why does Rochelle step into his life when he is lead by SS soldiers to the gallows? 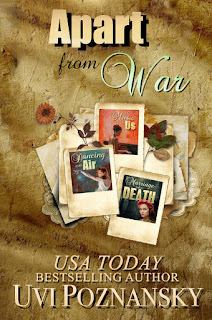 At the risk of being found out as a French Resistance fighter, what makes her propose marriage to a condemned man?’ Placed in context with the other two books this story rings with that special insight with which Uvi revisits the past. And few can do it better. Uvi touches us with a tenderness that unites her skill as a writer with her gifts as a visual artist and once swept into her fictional account of the ‘us’ of this book the story will long be remembered. Recommended.